How Much Is the Daily Dosage for Spirulina? Spirulina is a nutrient-rich blue-green algae found in supplements and some health foods. According to the University of Maryland Medical Center, a typical daily dose of spirulina is 2,000 to 3,000 milligrams, usually consumed in four to six portions of 500 milligrams each. 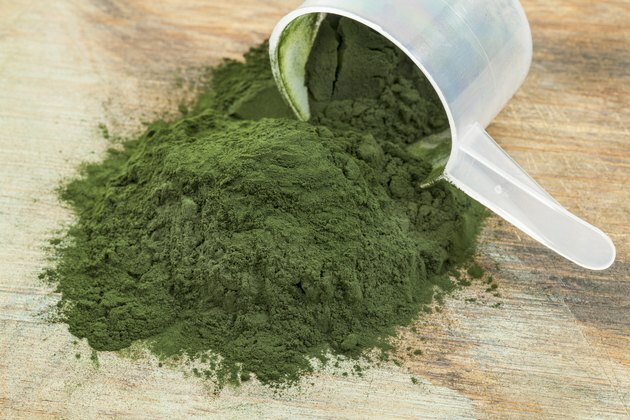 The medical center reports that even high doses of spirulina are safe, but you should avoid this algae if you have phenylketonuria or an autoimmune disorder. Even if you're healthy, speak with a doctor before taking spirulina or other supplements. According to MedlinePlus, some spirulina and other forms of blue-green algae may be contaminated by bacteria or heavy metals. In these cases, there is no safe dosage, as any amount may lead to serious health problems such as upset stomach, weakness, rapid heartbeat and liver damage. Contaminated algae may sometimes even be fatal. Spirulina grown in natural environments is most likely to be contaminated, so stick with varieties grown in controlled settings, and research the brand before you buy.